On Thursday March 3, 2016 Officers responded to a residential fire in the 300 block of Margret St. Upon arrival officers learned that there was a female inside of the residence. Officers attempted to make entry but were but were unable to do so, due to the smoke. After further investigation, it was learned the deceased female was Susan George, and her death was ruled a homicide. If you have any information that on this case, please contact St. Martin Crime Stoppers. All callers remain anonymous and are eligible to receive a $1,000 cash reward. On May 9, 2018 St Martinville Police responded to a shooting at 331 West Bridge Street. Responding Officers found Kendal Livingston and Chosen Washington inside of an apartment, both with gunshot wounds. Both victims were transported to local hospitals. Chosen Washington was pronounced dead at the hospital and Kendal Livingston is in stable condition. Anyone with information is asked to contact St Martin Crime Stoppers at (337)441-3030. All calls will remain anonymous and could lead to a cash reward. Investigators with the St. Martin Parish Sheriff’s Office needs your assistance in identifying suspects that are wanted in a strand of burglaries in the St. Martinville area. As a reminder, please make sure that you always lock up all of your valuables and keep them out of sight, and never leave your purse our any other valuables inside of your vehicle. The public’s assistance is needed in locating Andrew John Karcz, III who may be residing in the Opelousas area. Karcz is wanted by the St. Martin Parish Sheriff’s Office for several outstanding warrants including Violation of a Protective Order and Stalking. Anyone with information on the location of Karcz is urged to contact St. Martin Crime Stoppers at (337) 441-3030. You will remain completely anonymous and could be eligible for a cash reward. Investigators with the St. Martinvillle Police Department needs your assistance. On Saturday January 13, 2018 at approximately 10:20pm., three black males entered the Canal store located at the 500 Block of West Port Street within the city limits of St. Martinville. The Male subjects brandished a firearm and demanded money from the cashier. The subjects then left the business with an undisclosed amount of money. The subjects fled the business and were seen heading down East Port Street. On Thursday January 25, 2018 at approximately 9:30pm., one black male subject, wearing a dark colored hoodie, red shirt, dark colored pants, and a backpack entered the canal store. The male subject brandished a firearm and demanded money from the cashier. The subject then fled the area on foot heading down West Port Street. Attached are photographs from the surveillance film of the above subjects. If you have any information on either one of these armed robberies, please contact St. Martin Crime Stoppers at (337) 441-3030. You may also submit a tip at www.stmartincrimestoppers.com. All tipsters remain anonymous, and are eligible to receive a cash reward with information that would lead to the arrest of these subjects. The St. Martin Parish Sheriff’s Office needs your assistance in solving a burglary that occurred during the early morning hours of Monday October 16, 2017. 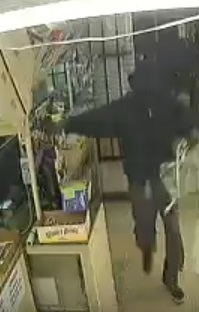 The burglary occurred in the 1500 block of Spanish Trail Highway, at the business of Food –N –Fun. Three black males broke the glass in the front of the store where they then entered and took and undisclosed amount of tobacco products. 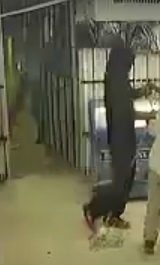 Below are pictures from the surveillance cameras. Suspect number one is seen wearing a red shirt, black pants, and red shoes. 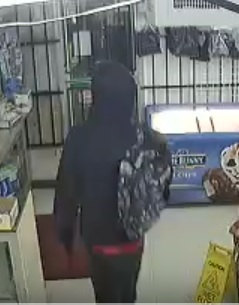 Suspect number 2 is seen wearing a gray hoodie, and blue jeans. Suspect number three is seen wearing a tan shirt. If you have any information regarding this incident, or know who the below individuals are, please contact St. Martin Crime Stoppers at (337) 441-3030. All calls will remain anonymous and could lead to a cash reward. The St. Martin Sheriff's Office needs your assistance. 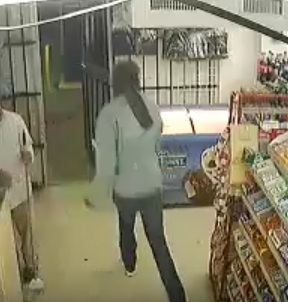 Investigators with the St. Martin Parish Sheriff’s Office need your assistance in identifying two suspects as seen in the attached videos and pictures, who are wanted in connection with the December 23, 2016 homicide of Lionel Potier of Cecilia. The incident occurred in the 1100 block of Orchard Park Drive in Cecilia just before 10:00 P.M. A white sports utility vehicle was seen in the area just before the homicide and leaving the area shortly after the homicide. Suspect one is identified as follows: Black male, 5’7”-5’10”, 180-200 pounds, has a possible bald spot on the back of his head and long side burns. Suspect two is identified as follows: Black male, 5’7”-6’, 180-200 pounds, with a full beard with long goatee. If you have information regarding this homicide, please contact St. Martin Crime Stoppers and leave a tip. Anyone with information, which leads to the successful identification, prosecution, and conviction of the persons responsible, could be entitled to a cash reward. Please call St. Martin Crime Stoppers at (337) 441-3030 with any information. Callers will remain anonymous. St. Martin Crime Stoppers needs your help. Investigators with the St. Martin Parish Sheriff`s Office are currently investigating several thefts of lawn equipment in the parish. In the past month, Investigators have seen a rise in thefts of zero turn lawn mowers. In three separate instances, a 60 inch Bad Boy valued at $6,000.00, a 54 inch Kubota valued at $10,860.00, and last Tuesday, April 18, 2017, a 60 inch Hustler Excel valued at $5,000.00 were stolen. Anyone who has information on this crime or the whereabouts of the stolen items is encouraged to contact St. Martin Crime Stoppers at (337) 441-3030. You can also submit anonymous tips by texting SMCS plus your message to CRIMES (274637) or from our website www.stmartincrimestoppers.com. You will remain completely anonymous and could be eligible for a cash reward.